June 2016 – Never Stop Questioning! Two of our fourteen baby Corn Snakes have found a temporary home at our favorite reptile pet store, Pets-A-Plenty. They were stubborn little eaters for me but the experts at Pets-A-Plenty have had no problem getting them to eat. They are happy and healthy there. Check out the link: The Ultimate Reptile Shop This store is a GREAT field trip. (Caution: They are closed on Thursdays). You can feed a Caiman or a Kookaburra and see all sorts of AMAZING reptiles. That leaves twelve little baby snakes here living in our laundry room, eating well and ready to go to new homes. That includes both of the amelanistic snakes, Rainbow and Sherbet! Remember Rainbow has the little kink in her tail and will need some extra love. I am hoping to get all the babies into their new homes this week and next. 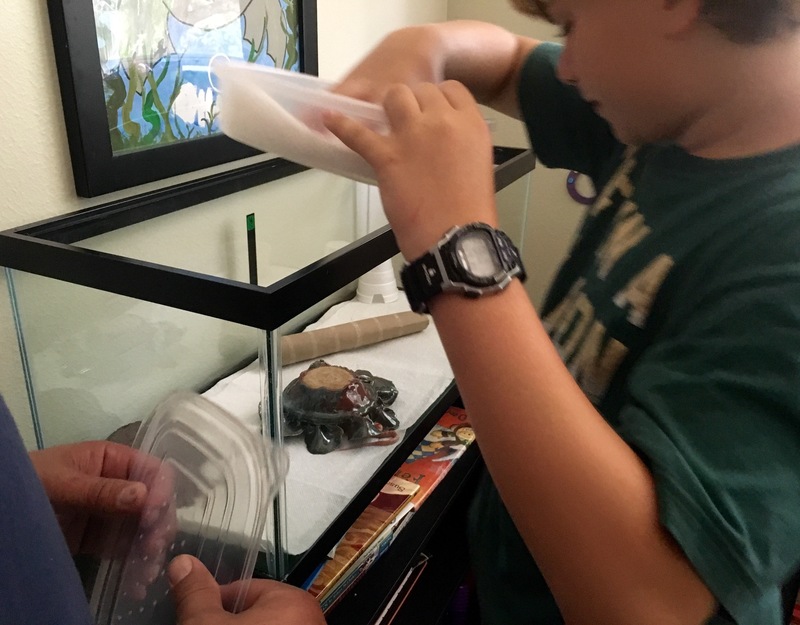 Please let me know if you are interested in a baby Corn Snake as a pet via an email from your parents to: dcaldwell@conroeisd.net. The babies are FREE to a caring home. Pets-A-Plenty is a good first stop before coming to visit the Caldwell laundry room. They will set you up with everything you need to provide an excellent habitat for your snake and they will expertly answer all your questions on how to care for them. A 10 gallon terrarium set up is $99.99 and a 20 gallon is $140. I recommend the 20 gallon. It will meet the needs of your pet when it reaches adult size so there will be no need to ever “upsize”. Pets-A-Plenty also sells frozen mice in bulk for the best pricing. Bring an ice cooler if you go to Pets-A-Plenty so that they stay frozen for your drive back to The Woodlands. You can get the frozen mice at Petco too but they more expensive. So as you have likely noticed from the home page of my blog. Scuba diving is a passion of mine and I am mesmerized when I encounter sea turtles in the wild. The photograph of the sea turtle on my blog home page is one that I took two years ago while diving in about 40 feet of water off the west coast of Grand Cayman Island. Galveston NOAA Sea Turtle Lab Info.